This popped up on my Facebook newsfeed today. Normally, I consider the newsfeed the most terrible invention of our time; scrolling through it is a horrible mix of masochism and schadenfreude that leaves me feeling either dirty, depressed, incredibly useless, guilty, or all of the above. Seriously, it’s the devil. 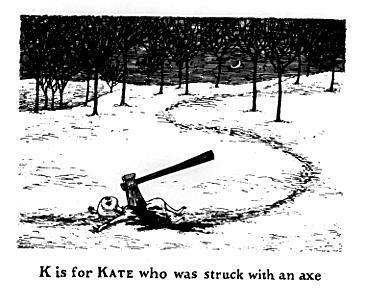 But Edward Gorey is wonderful. And though I’ve decided not to take it as a sign (chances are I won’t get struck with an axe. I haven’t been camping in awhile, though now that I think about it, lumberjack weekend is coming up, so maybe beware? Anyway…) and instead use it as a prompt to share an injury story. I was always a really clumsy kid. I was tall and gangly and very, very skinny and I had no idea how to use all these unruly limbs. I walked into things and fell off things (sometimes they were the same thing! I was that talented). But this particular story is about an injury that really wasn’t my fault. I was pretty young, probably seven or eight, and I was on vacation with my family. My dad was teaching my brothers to fish while I did something else. Lest you think he was being sexist, my dad also taught me to fish, though I tended to enjoy the part where we actually caught something the best, and he seemed to like the sitting-in-the-boat-doing-nothing part even better. Sometimes he would catch a fish, gut it, and pop out the eyes and eat them. He once offered one to me, and I ate it. Even though my brothers were really grossed out. Anyway, I was doing something on the shore while my brother cast off the edge of the dock (catching frogs? let’s say I was catching frogs) when I suddenly felt something hit my head. And then it pulled. Yeah, my brother had hooked me. Someone’s lure was stuck in my scalp, and I don’t think anyone realized right away, because he just kept pulling. So I started yelling. And then they all noticed and came running, bringing the fishing rods with them and almost tripping over the line. My dad had to cut the hook out of my head, but first he pushed it all the way through. I don’t remember this part, but I think he used wire cutters to trim the hook. He got it out eventually, but my hair was a mess of blood and I was crying all over the place. But once I calmed down, there were plenty of “you hooked a big one!” jokes to be made. And I think I probably enjoyed them, at least a little.